You will fall in love with Magic Slates! No matter what age you are, these amazingly, simple bags of “squish” will delight you. Squish them, draw lines in them, chase the bubbles or hold up two different colors to the light to mix colors or just let the sunlight filter through them to put a spin on your view of the world. Warm them up in a sunny spot, then enjoy the warmth of your bag. it will leave you feeling ready to smile. Materials: Heavy duty storage bags that seal. Check each bag before you start to see if it has any leaks in the corners. Procedures: Pour about 1/3 cup of corn syrup with a few drops of food coloring into each bag. 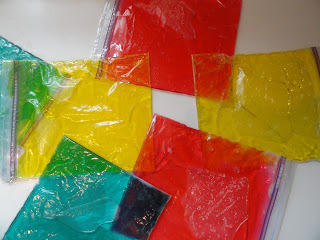 Primary colors work well, especially if using this activity to teach how colors are made. Seal each bag and add a reinforcement of clear packing tape across the top to prevent curiosity sticky messes! A strip of clear plastic tape on all four sides would also help, if you are worried about a leak. Always check the bags for leaks before and after each play time!